The Views we present in this section are probably familiar to you from other user interfaces. Their purpose is to allow the user to choose from multiple options. CheckBoxes are typically used when you want to offer multiple selections with a yes/no or true/false choice for each. RadioButtons are used when only one choice is allowed at a time. Spinners are similar to combo boxes in some frameworks. A combo box typically displays the currently selected option, along with a pull-down list from which the user can click on another option to select it. Android has adapted these familiar components to make them more useful in a touchscreen environment. Figure 3 shows the three types of multiple-choice Views laid out on an Android application, with the Spinner pulled down to show the options. The file just lists each View we want on the screen along with the attributes we want. 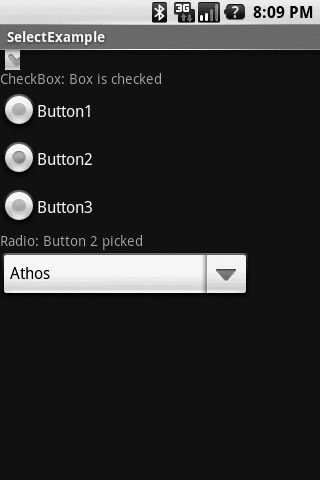 A RadioGroup is really a ViewGroup, so it contains the appropriate RadioButton Views. Example 3 shows the Java file that responds to user clicks. The CheckBox View takes care of flipping its state back and forth and displaying the appropriate checkmark when the state is true. All you have to do is create an “OnClickListener” to catch click events, and you can add whatever code you want to react. As mentioned earlier, the RadioGroup View is really a ViewGroup that contains any number of RadioButton Views. The user can select only one of the buttons at a time, and you capture the selections by setting OnClickListeners for each RadioButton. Note that clicking on one of the RadioButtons does not fire a click event for the RadioGroup. Create a list of the selections (which can be a dynamic list built and changed by your application). Create an ArrayAdapter from the list that the Spinner can use for its drop-down list. Note that the formats shown for the ArrayAdapter (simple_spinner_item and simple_spinner_dropdown_item) are defined by Android; they do not appear in your resource XML files. Create an onItemSelectedListener for the Spinner to capture select events. The listener has to contain both an onItemSelected method and an onNothingSelected method.